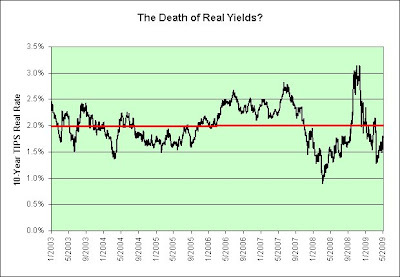 The Death of Real Yields? As an investor, rising oil demand is exactly what I'm hoping for. I rank it right up there with a sharp poke to the eye and a swift kick to the gut. What can I say? I LOVE PAIN! You know what else I'm hoping for? A stranger. Strangers are cool. Strangers give me free candy. In the future, cities will become deserts... roads will become battlefields... and the hope of mankind will appear as a stranger. Unfortunately, apparently the "hopes for rising oil demand aren't borne out by reality", at least not yet. I guess I'll just have to pin my "hopes" on something else. But what could it be? I know! We could just take on more and more debt to make it seem like the economy is humming along like a well "oiled" war machine! Debt could create a never ending illusion of prosperity! Genius! LAS VEGAS—Casino operator Harrah's Entertainment Inc. says it plans to sell $1 billion in new notes through a private offering to help it pay older debt and company expenses. Meanwhile, a Mr. Barnum Harrah of Las Vegas, Nevada says he plans to issue himself $10,000 in new credit card debt through a private offering to help him pay older debt and his company's expenses. Coincidence? His older debt includes but is not limited to debt he ran up betting on "sure things" in Sin City. His company's expenses currently includes those of Joe, his unemployed construction worker brother and Floyd, his out of work investment banking uncle. Joe and Floyd were only supposed to be visiting him for a month, but you know how company can be. That being said, Barnum continues to be optimistic about the future. He's planning to pay off all this new debt off as soon as he wins the Nevada State Lottery. Why Nevada? He's got a lucky feeling. What Barnum doesn't realize is that there is no Nevada State Lottery though. Who would have guessed? Lee long has opposed lotteries on the grounds they attract poor people who cannot afford to gamble away their grocery money. Lotteries have been outlawed in Nevada since the state constitution was drawn up in 1864. Once a lottery appears, who knows what other forms of gambling might come along with it. I salute you Nevada. Way to take the high moral ground when it comes to legalized gambling. I stand by your zero tolerance policy. It starts with a lottery and it no doubt ends with the state being overrun with slot machines and casinos. Can't have that. I mean really, that's just ridiculous. Before you know it Las Vegas would get the nickname of Sin City and speculators would gamble on the state's real estate market too. Where would it end? Every building lit up like a Christmas tree? Non-stop gambling action? Loans being handed out to people with no jobs so that they too could speculate? Can't you just picture it? It's never going to happen. Period. Disclaimer: Barnum, Joe, and Floyd are fictional characters. Any resemblance to actual people is simply a coincidence. A sad and tragic coincidence. Sigh. Show of hands? How many more days can oil rise before something seriously breaks again? It took $140+ to kill the global economy last time around. I don't think it will take anywhere near that this time around. "Will the economy grow and expand vigorously in the face of sustained higher interest rates?" Oh oh. Something seems horribly wrong. This is WAY too easy. What's that "vigorously" doing there? Holy cow! It's a frickin' rhetorical question with just a hint of sarcasm. Why didn't I see that earlier? I can't use sarcasm to heckle valid sarcasm. The entire integrity of my blog fall would fall apart. Yet, I can't back down now. I've already committed to this sarcasm report and I've gone live! Using monthly data going back to July of 2001, I have come up with the following closest match to the shape of the current yield curve (as of April, 2009). I used a least squares approach with all time periods being equally weighted. 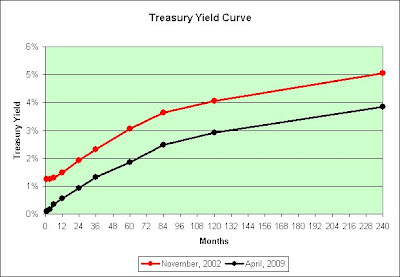 As you can see, the shape of the yield curve in November of 2002 is extremely similar to the shape of the yield curve in April of 2009. The only real difference is the overall change in interest rates. They fell. Using hindsight, November of 2002 was a really good time to be buying stocks, assuming you sold them before they came crashing back down to even lower levels in 2008 that is. Interest rates have been falling for decades. Some of it can clearly be seen in the chart above. If the trend continues, interest rates will need to go negative to keep the party going during the next downturn. How's that going to work? Just imagine how great it would be if it truly did work though. Our government would earn interest on all the debt it has. Can't you just picture negative 1% interest rates? Prosperity baby! For each trillion we owe China, China could pay us $10 billion annually. Problem solved! Sarcasm! Mankiw's Negative Interest Rate Solution? One outcome is implementing Mankiw's theories and hoping nobody screams currency crisis in a crowded movie theater. Yeah, I really like that one. Maybe he can get Japan to try it first, lol. Sarcasm! Another outcome could be using inflation as a way to simulate negative interest rates. We saw how well that worked last time. How high did oil go before things seriously fell apart? The question of the century therefore continues. Do I brace for deflation or inflation? I've been a bear since 2004 and I'm still not sure. If the price of housing is any indicator, then we bought way too much stuff on credit. 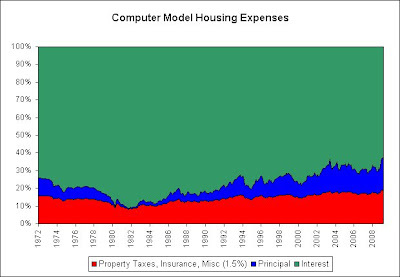 It seems unlikely that buying MORE stuff (hoarding) and/or piling on more debt is the greatest of plans. That's the deflationist in me talking. However, Ben Bernanke said, "But the U.S. government has a technology, called a printing press (or, today, its electronic equivalent), that allows it to produce as many U.S. dollars as it wishes at essentially no cost. By increasing the number of U.S. dollars in circulation, or even by credibly threatening to do so, the U.S. government can also reduce the value of a dollar in terms of goods and services, which is equivalent to raising the prices in dollars of those goods and services." I believe it is a threat. I believe it is credible. I believe it truly creeps me out too. Perhaps I never really thought of a monetary printing press that can create dollars at essentially no cost as being some sort of technological breakthrough. That's the inflationist in me talking. What do I do when I feel threatened? No matter how much money appears, all I seem to do is hoard future needs. Is going to the mall a future need? Not really. Is eating at restaurants a future need? Not really. Doesn't our economy need people going to the mall and eating at restaurants? That's the long-term stagflationist in me talking. Perhaps our economy shouldn't need people going to the mall and eating at restaurants as much as it does though. Wouldn't it be nice if our "advanced economy" didn't import much of what it needs from other countries? Oil? Made in China? That's just me being bearish again. Sorry! Who should we ask? The people? Banks? China? Oh, I know. Let's ask the People's Bank of China! I hope all this Chinese bearishness doesn't become a "pandamic"! Thank you. Thank you very much. I'll be performing pun-based dark sarcastic gallows humor until the illusion of prosperity is fully restored. You've been a great audience. Oh please. Stop already. 1a. Oil prices rose much faster (in percentage terms) than stock prices and housing prices on the way up. 1b. Oil prices crashed much harder (in percentage terms) than stock prices and housing prices on the way down. 2a. Oil prices are now rising much faster (in percentage terms) than stock prices and housing prices on the way up, again. In fact, oil is beating the living daylights out of housing prices right now (since housing prices are still going down). I have this strange feeling of déjà vu. Will there be a 2b? How much longer before we get the rest of the cycle? I therefore offer the stagflationary theme song as sung through the lungs of oil. Oil is such a great performer! I heard the following joke on the radio. I doubt I can do it justice but I'm going to give it a shot (and seriously embellish the heck out of it for dramatic effect ;)). A guy sees an ad in the paper for a dog. He visits the house and asks the owner if he can see it. The owner tells him that the dog is in the back yard. The guy heads off to the back yard. The dog is just sitting there, looking at him. The guy says, "Hey, you are a pretty good looking dog." The dog replies, "Thanks." The guy is blown away! He exclaims, "Holy cow! You are a talking dog!" The dog replies, "Yeah, it's a long story." The guy wants to know all the details and the dog is more than happy to comply. Here is his story. "I learned to talk as a puppy. I was able to read the lips of all the animals that I have met and that combined with my advanced intellect allowed me to pick up their languages fluently. Humans are one such animal. At the age of one, I convinced my owner to send me off to college. I told him there would be money in it for him and his small investment would pay off big time. It would have too, in ways he couldn't have possibly even imagined, except that I was halfway through my PhD in Physics when the CIA caught wind of my genius. I was shipped off quietly to Langley for advanced training. The training didn't take long since I'm such a faster learner and was naturally adept at the obstacle courses. Once complete, I found myself on a military transport plane headed overseas. I was dropped near a terrorist training camp and had no problem whatsoever infiltrating their network. Nobody expected a talking dog, much less one with an IQ off the charts. After thwarting many serious threats to our country, I was then sent to Europe. There, I uncovered a threat to use nuclear weapons against us. In the days that followed, I single-handedly managed to save the entire planet from global war. Of course, nobody knows about that. Nobody ever hears of the successes in the CIA, only the failures. After putting in a few more years of hard work, and after saving the planet numerous additional times, I finally convinced the CIA that it was time to retire. Sure, they attempted to stop me but by that point they were no match for my counterattempts. In the end, they knew it was best to just let me go peacefully." The dog then says, "That's where you come in. I'm done saving the country. I'm also burned out. I just need an owner who wants to play frisbee every now and then, but mostly I'd just like to kick back on the couch, perhaps sharing stories of my exploits. Can you blame me?" "That dog is SUCH a liar! He didn't do ANY of that stuff!" That dog reminds me of our economy for some strange reason. Hahaha! Sigh. Okay, the headline isn't all that optimistic. I'll grant you that. Graduates hoping to become Wall Street wunderkinds or commercial real estate tycoons better be thinking about Plan B. Other than those with specialties in bankruptcy, the Plan A jobs simply are not there. He's not all that optimistic about Plan A and Plan B. I'll grant you that too. Moreover, those who waste too much time pursuing jobs that are not available are likely to end up in Plan C, working at Starbucks. There's way too much optimism about Plan C though. In his defense, perhaps Plan C was intended to be symbolic and I'm just taking it way too literally? A man on a mission to visit every Starbucks in the world has a problem: Starbucks Corp. is closing scores of stores he has yet to visit. The freelance software programmer, 37 years old, calls himself Winter. He was on a job in Wisconsin last month when he learned that a Starbucks in Prince George, British Columbia, would close the next day. He spent $1,400 to jet there for a cup of coffee -- sugar, no cream -- and a photograph. "If the store closed before I visited, I would lose another piece of my soul," Winter says. Imagine spending $1,400 to buy a cup of coffee but not actually getting it? Oh the humanity! You really have to sympathize with Winters. This downturn is likely to cost him yet another piece of his soul. By the looks of it, there isn't much soul left to lose. Further, you just can't put a price on unsecured souls these days. Moody's Investors Service has lowered its rating on Starbucks Corp.'s $550 million senior unsecured notes to just above junk, citing the Seattle-based coffee retailer's challenge of refocusing its business amid the recession without "significantly damaging" its brand. We're All "Just Above Junk" Now! Same-store sales, or sales at stores open at least a year, fell 8 percent both worldwide and in the U.S. That was a slight improvement from the prior quarter when Starbucks' global same-store sales fell 9 percent and U.S. same-store sales declined 10 percent. The ship was sinking at a 9 to 10 percent rate and now it is only sinking at an 8 percent rate? Oh happy days! If you are a passenger, please enjoy this complimentary party hat! If you are a member of the general crew, please rearrange the deck chairs so that there is a clear path to the life boats. Don't forget to keep the music playing though. If you are a ship's officer, please move calmly and quietly to the life boats. Do not put your life jacket on until you are free of the ship and safely out to sea. There's no reason to create a panic. Because the company’s share price has significantly dropped in the past year, officials at Starbucks Corp. are giving employees with stock options a chance to swap out their “underwater” options. Ministers have forecast that 80 per cent of the 1.7 million jobs expected to be created by 2010 will require degree-level qualifications, as well as saying that graduates will earn on average over a working life £400,000 more than people who do not go to university. However, Professor Brown and Dr Hesketh say that such estimates are — even by the Government’s own admission — based on the “most optimistic” reading of existing data and appear to be overinfluenced by discredited assumptions that the growth of a “knowledge economy” in the 1990s will continue. They have analysed US data which suggest that just one in five workers has a job which makes use of degree-level education, before going on to question the Government’s predictions that 40 per cent of Britain’s labour force will be in “knowledge-based” employment by next year. Of course, that was controversial and attempts were made to debunk it. Claims that the expansion of higher education will create a "glut" of graduates who cannot find well-paid jobs are wrong, according to a report on the country's skills gap published this week. Let's fast forward to last year. For decades, the typical college graduate's wage rose well above inflation. But no longer. In the economic expansion that began in 2001 and now appears to be ending, the inflation-adjusted wages of the majority of U.S. workers didn't grow, even among those who went to college. That expansion did more than appear to be ending. Goodbye expansion. Hello contraction. College-educated workers are more plentiful, more commoditized and more subject to the downsizings that used to be the purview of blue-collar workers only. More plentiful and more commoditized? Isn't that just another way of saying glut? The issue isn't a lack of economic growth, which was solid for most of the 2000s. It is now. Further, when I think of solid economic growth I don't immediately picture the 2000s. Other than the dotcom crash, the housing market, and the banking system crisis ruining the illusion of prosperity it was as solid as they come though. I'll grant you that. And finally, let's check out what's going on today. Only one in five graduating job-seekers had lined up jobs by the end of last month. Two years ago, half of the students who sought jobs had one in hand by graduation day. And lastly, no talk of college degree gluts would not be complete without mentioning China. The rest of the world competes with them on so many levels, but they also compete with themselves. NANJING, China -- Zhang Weidong has been making the rounds at this city's weekend talent fair for more than a month now and can't understand why he hasn't landed a job. Could it have anything to do with the 21.5 million students enrolled in Chinese universities in 2008? Words cannot do it justice. If you feel so inclined, the article does include an overhead view of a recent job fair though. Good grief! Felix Salmon said it and I thought I would share. You feel much better now, don't you? What’s more, S&P putting the UK on watch for a possible downgrade is a decision prompted by economic fundamentals. Any such move with the US, by contrast, would be entirely political, and in any event would say much more about S&P than it did about Treasuries. Any downgrade to US debt would be entirely political? Not a bit of it would be due to economic fundamentals? Wow! That's sure a relief. I never would have guessed it. I'm going to be sleeping like a baby now. To think I was wasting all that time being worried. This is fantastic news. Of course, I probably should not just take that on face value. When people tell me "not to worry" I really should use some hindsight to see if they've done it in the past, and if so, to see if it was actually good advice. This is especially important since most of my life savings are in the thing I'm being told not to worry about (US Government TIPS and I-Bonds). Oh crap. That was said just before the official recession began. I'm not going to be sleeping well after all. I'll still be sleeping like a baby though. You know, waking up every few hours and crying. Actually, all is not lost. Felix Salmon also wrote the following. Perhaps there is some hope. What Is Ben Stein Smoking? For it turns out that Stein is completely wrong, yet again: can anybody explain to me why this man still has his column? I heckled Ben too, just one week earlier (and a few times since). Here's what I wrote in response to Ben Stein's "Anticipating All the Retirement Variables" article. Needless to say, hindsight shows that Ben Stein did not actually anticipate all the retirement variables. He missed a few. Let's see. He missed the housing bubble variable entirely it seems. There's that part where he trusted that Ben Bernanke wouldn't "allow the financial markets to seize up", how the "smart money never bets against the Fed", and "the Fed can create a literally infinite amount of liquidity". Is that three missed variables or just one? I'm trying to be fair here. The "emerging-markets stocks I've been touting for so long" variable crashed the system, then promptly burned. The "I was able to dispense some halfway-decent advice: Stay calm, keep invested, and keep buying" variable looks a bit like the square root of negative one to me. Not quite sure what to do with that one. The "Annuities to the Rescue" variable somewhat backfired in a cloud of black smoke and grinding metal. AIG was sort of, kind of, in the annuity business and we all sort of, kind of, rescued it when the government stepped in. It might have something to do with the $62 billion quarterly loss that was the largest ever recorded by an American company. The "I hope it doesn't turn around and bite my head off the way it did in the tech crash" variable was dead on the money though. NEW YORK (AP) — Treasury prices dropped Thursday as credit ratings agency Standard & Poor's raised questions about the ability of governments to stimulate the economy with public spending. That's going to do wonders for the housing market and the unemployment situation no doubt. NOT! You know that crazy theory I had about real yields falling? You know, to spur the economy and justify my stagflationary name? It was kind of based on a functional monetary helicopter. I'm not sure we have one of those at the moment. Do you realize it's been over a year since I wrote the following? My short-term deflationary mood (as seen in the upper left corner of my blog and in my most recent post about the possibility of a commodity crash) is kicking in it seems. I'm still stagflationary long-term. Oil was $105.74 a barrel that day and supposedly heading higher. It did head higher, temporarily. Using hindsight, it is fortunate that I never did define what my version of the short-term is/was. In the grand scheme of things, Japan has been in an deflationary environment for the short-term I suppose. If one merely thinks of the long-term as being the age of the planet that is! Sigh. I'm still stagflationary long-term though. Perhaps I shouldn't be, but my gut is still very much willing to hoard basic necessities. Further, my nose is too. Something smells off. That being said, the following is well worth a read. I mostly agreed with Bob Hoye's conclusions long before the crisis hit. Had I fully agreed with him, I'd have done even better though. I'm not going to bother quoting him. It's all a worthy/scary read (from the heckling the Fed to the heckling of Mankiw, he covers it all). Newly-released US census figures show a strong slowdown in the birth-rate that began before the economic crisis hit. Main Street saw it coming before the banking system, Wall Street, and government. The first real sign of the financial meltdown was in August 2007 when credit markets froze up, but unemployment was still low and consumer confidence high. How did Main Street figure it out then? There were absolute declines in the number of births in 13 of the 50 US states, including some of the poorest, such as Louisiana and Mississippi, while North Dakota, which showed strong economic growth due to an oil boom, had the biggest increase in births. I can't quite put my finger on what might have caused people to have concerns about the long-term future of our country even before the economic crisis officially hit. Nope. Completely stumped. Not a clue. It's a big picture Smörgåsbord! Three years ago, when costs were increasing by 9.6 percent, employers shouldered most of the burden. Costs went up, but they went up less for employees, who saw the amount coming out of their paycheck to pay for health care costs increase 5.4 percent. Today, the trend has reversed. According to Milliman’s data, employer costs in 2009 will rise 5.4 percent; employees, meanwhile, will see nearly a 15 percent increase in the amount of money that comes out of their paycheck to pay for health care. Then add another 5.4 percent increase in the amount employees pay out of pocket (and already taxed) for other health care expenses. Behold the hidden "benefits" of rising unemployment. Businesses no longer feel the need to shoulder as much of the burden of rising health care costs. That isn't what truly concerns me though. It's what's on the horizon. The road to recovery still looks bumpy, but Obama and Bernanke say the view on the horizon is going to be better in many ways. And Texas may be on the forefront of that changing economic landscape, as sectors such as construction and retail shrink but energy and education continue to grow. Back in 2002, China's universities graduated 1.5 million students. That number has now quadrupled, with some six million out looking for a good job come the summer. But job offers are in decline. In fact, graduate unemployment was even an issue three years ago during those heady days of double digit growth rates. So what hope now for the class of 2009? There's a perfect Chinese storm. Despite the global steel industry's drastic decline, and serious production surpluses in China's steel industry, China's iron ore imports in April rose 9.45%, month on month, and 33%, year on year, to set a record high. In the first four months of 2009, China imported 188.46 million tons of iron ore, up 22.9%, year on year, most of which was imported not by steel makers but by iron ore dealers. After entry into China, it was promptly arranged into piles in China's ports, where it sits. This doesn't exactly inspire me to hoard iron right now as a way to protect myself from rising health care costs, and I am yet somehow drawn to lumps of coal. Am I a stagflationist? Am I an deflationist? Am I an inflationist? All of the above! Let's just say that the Ghost of Christmas Past, Ghost of Christmas Present, and Ghost of Christmas Yet to Come all visit me daily. Here's what I like about Ebenezer Scrooge: His meager lodgings were dark because darkness is cheap, and barely heated because coal is not free. First off, I want to say that I don't smoke. On the one hand, if people find pleasure in doing something that will most likely lower their life expectancy that's just fine by me. We're all going to die someday. Smokers should be aware of the risks by now. I'm generally not in favor of government attempting to dictate risk management onto individuals. On the other hand, I am in favor of smoking bans to protect me from smoke in public places and the workplace. That does not mean that I would be opposed to private restaurants that allow smokers to smoke though, since nobody is forcing me to patronize them. Further, one would think that in a capitalistic society, the free market itself would eventually open up at least a few smoke-free restaurants to cater to my desires. So anyway, that's my stance on smoking. We are repeatedly told that smokers are a financial burden to us all. It is used as a justification to increase the taxes on smokers as a way to pay for it. However, is smoking actually a financial burden on society? The reason: The thin, healthy people lived much longer. It seems that the "smoking burden" myth falls into the Iraq's weapons of mass destruction filing cabinet. Big surprise there. Now there is talk of a soda pop tax. Pro-Con Should Congress tax soda pop to pay for health care? Let's start with the "No" camp first. That's the camp I'm in. It's a tax on food. That means it hits the poor the hardest (since the poor spend a larger percentage of their incomes on food). How is that even remotely fair? You know how everyone was telling us to invest in “Forever” stamps before the postal rates went up this week? Here’s an even more useful tip: Stock up on soda. Here's a glimpse from the "Yes" camp. The thinking, in part, is that, as with smoking, those who sell soda and those who consume soda ought to help pay for the cost of health care associated with the product. As seen above, smokers do not appear to be a financial burden on society. They cost more per month (as seen in insurance rates for smokers vs. non-smokers) but they live fewer months. Further, it doesn't even speak of the savings to Social Security and Medicare as smokers die earlier than average. If we based the tax solely on the thinking that smokers "ought to help pay for the cost of health care associated with the product", then smokers should actually be given a rebate, not an extra sin tax. Why is it automatically assumed that those who consume soda will be a financial burden too? It is not possible to remain permanently healthy no matter what we do. Eventually, we all become less healthy and at some point we will all die. Prolonging it seems to me to be the bigger financial burden on society. Picture what would happen to Social Security and Medicare if we all live to be 100 years old. I really didn't want to go down this path. I don't enjoy putting a price on human life. However, that's exactly what the government is trying to do with these sin taxes, and in my opinion they've got the math completely backwards. The true sin is finding new excuses to tax the poor while turning a blind eye to the outsourcing of jobs to China, India, and Mexico. In this respect, I'm completely in favor of sin taxes. Let's tax the sinners. Congress just took a pay raise - Didn't they tell you? I think it's a mighty fine thing that we taxpayers can afford to give our duly elected representatives a raise in pay. It's a sure sign of how well we are doing as a nation. Never mind the fact that the recent congressional pay raise of $4,700 equals almost 20% of what I earn annually, or equals about 10% of the annual salary of a teacher, fire fighter, or cop. Those hard working legislators deserve every dollar they get -- all $169,300 of them. The following link is old but I can't seem to get it out of my thoughts. I strongly suspect Mankiw has vastly underestimated how effective his solution would be at thwarting deflation. Mish offered a great heckle but I've decided to do a serious heckle of my own. If nothing else, I've had a month to think about it. A currency crisis, which is also called a balance-of-payments crisis, occurs when the value of a currency changes quickly, undermining its ability to serve as a medium of exchange or a store of value. 1. 10% of the currency is destroyed instantly at the time of the Fed's announcement. That's clearly meets the "value of a currency changes quickly" criteria and therefore undermines the currency's ability to serve as a medium of exchange or a store of value. 2. Not knowing which 10% has been destroyed until a full year has passed adds long-term uncertainty. We know that uncertainty breeds fear and panic. Fear and panic clearly undermine the currency's ability to serve as a medium of exchange or a store of value. 3. The currency is destroyed randomly by pulling a number out of a hat. Randomness is the very essence of uncertainty. Once again, more fear, more panic, and it further undermines the currency's ability to serve as a medium of exchange or a store of value. 4. Would the currency truly be destroyed randomly? Imagine the money that could be made for those who knew ahead of time which dollars would turn worthless. Conspiracy theories and rumors about a currency can clearly undermine its ability to serve as a medium of exchange or a store of value. 5. If the government is willing to destroy 10% of the currency instantly, then most reasonable people would entertain the notion that the government might do it again. This adds even more uncertainty, more fear, more panic, and undermines the currency's ability to serve as a medium of exchange or a store of value. Worse, markets tend to look ahead. How much future currency destruction would be priced in immediately? 6. Our currency is backed by faith. It says right on the dollar that "This note is legal tender for all debts, public and private." If it no longer was legal tender, then the dollar would have incorrect information on it (a lie). That would transform the faith-based currency into a lie-based currency. That would clearly undermine the currency's ability to serve as a medium of exchange or a store of value. Mankiw says, "the expected return to holding currency would become negative 10 percent." Based on what I've written here, I would argue that it could easily approach something closer to negative 100%. Behold the power of compound unintended consequences and the ability of mainstream economists to ignore them. I bet it would. Picture the mid-level manager who doesn't know the first thing about the tasks that he's managing and is actually only working at the company because he's got an MBA. Hey, I'm just saying that it's been known to happen. That's where replacing the workers with robots and receiving a pictogram based operational guide can make all the difference. Unskilled workers will be able to operate the basic functions of the HortiBot within one hour of education and by use of a pictogram based operational guide. He also said, "Little of what is taught to students in business school prepares them for the corporate workplace. You have to question what goes on in the two years it takes to get an MBA, if someone can virtually be equivalent in two or three weeks. What that suggests to me is that if you take a smart person, and give them a relatively short course, a mini-MBA, if you will, they basically do as well as the MBAs." Based on the HortiBot, it might only take an hour to learn how to effectively manage the workers of the future. How cool is that! I'm also trying to see the big picture from the CEO level. It would be a shame to waste the precious resources of this country. There are millions of vacant unsold homes all across the country. Most of these homes are already hooked up to the power grid. Perhaps we could let the robotic workers of tomorrow recharge inside them at night? It could be part of a government sponsored RARP (Robotic Asset Relief Program). I think that the market has rallied a lot. I think it is a bear market rally. Some would argue it is a bull market. I don't think most businesses would agree with that because business conditions have not improved that much. The economy has stabilized both inside China and elsewhere, mainly due to inventory cycle and as well as the liquidity support for corporate balance sheet. It is not a contracting like before, but we are not seeing strong upward growth momentum. Let's use the wayback machine to see just how kind hindsight has been. 2005: He warned of the housing bubble. 2006: Morgan Stanley let him go for speaking his mind in an internal e-mail. 2007: He warned that China and the global economy would crash. 2008: He warned that America would need to wake up to reality. 2009: He warns that global markets are in for a rude shock. The US economy is facing its biggest crisis since the Great Depression, one that will require considerable sacrifice to solve. But politicians are talking the other way and promising more goodies. Like him, I'm not a believer in "something for nothing" solutions. Few doubt that in a world of recession and toxic debt, Asia is the least ghastly region. But 38 percent? Or 52 percent? Bullish on Japan? All that’s driving the rally are signs that the U.S. may not be heading into a new Great Depression. It’s not underpinned by indications that solid growth is afoot, just a sense that fewer of us will soon be homeless. Bubble, anyone? From what I've read over the years, bet against William Pesek at your own peril. I've quoted him quite a bit since starting this blog (mainly because I think he truly gets it). Let's use the wayback machine to see what he said before the global economy crashed. Rarely have monetary-policy makers faced a more daunting assortment of things that could go awry. They include a global credit crunch, swooning stock markets, out-of-whack currencies, hedge-fund blowups and whether to fret more about inflation or recession -- or both. Policy makers are merely putting off the inevitable and treating the symptoms of what ails the global economy. If they aren't careful, Japan's experience during the 1990s will become a familiar one. 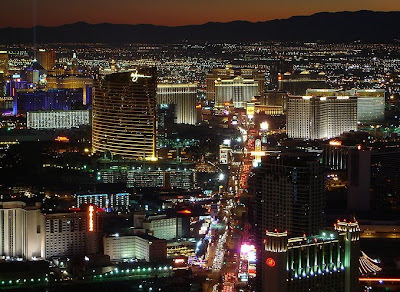 During the boom years, no place in America boomed more than Las Vegas. But when the economy collapsed, Vegas fell hard. Laura Ling tours the wreckage of Sin City, from unemployed strippers and half-built, abandoned casino projects, to hospitals turning away cancer patients and ambulances, to one of the few remaining boom industries--evicting people. It is well worth a look. Be warned that it won't let you walk away with a warm and fuzzy feeling though. It is rare around here, but I'm thinking it is somewhat well founded. I'm ever so slightly more optimistic today. The employment situation looks very ugly and I expect our long-term employment situation to remain very ugly (as we continue to automate and outsource jobs), but there is a small ray of sunshine buried within the "household data". Has the cliff diving slowed or better, even stopped? Yes, unemployment rose. We all expected that. Had you asked me several weeks ago, I would have expected worse though. More people are trying to find jobs it seems. It makes sense. Some who thought they were comfortably retired and were enjoying never ending gains in the stock market and real estate have no doubt altered their opinions. If the data can be believed (it is just one month's worth), then I am somewhat optimistic. It is better to have higher unemployment because many more people are looking for work than it is to have higher unemployment because jobs continue to disappear at higher and higher rates. The economy overall can somewhat survive the former, but not the latter. That being said, I am not optimistic. I'm simply more optimistic. Big difference! Here are two reasons I'm not all that optimistic. 1. The price of oil rises every time the economy is seen to be improving. Return of the Killer Commodity Bubble, Commodity Bubble: Season of the Peak Oil, Commodity Bubble IV: The Final Chapter, Commodity Bubble V: A New Beginning and so on would be exciting movies to watch of course, but would make protecting my nest egg that much more difficult. Sigh. 2. The same employment report shows 539,000 jobs were lost overall within the "establishment data" survey. The data comes from two different surveys (household data vs. establishment data) and the pictures they paint is conflicting. However, the 539,000 number is not as bad as I would have guessed just two weeks ago. I guess that's something. There are two sources of labor market statistics, the Establishment Survey and the Household Survey--both conducted by the Labor Department. The first asks manufacturing and service sector companies how many employees they have. The second asks a sample of people whether they have jobs. The two give different answers and, important right now, the difference changes systematically over time. The reason is that the number of companies does not remain fixed. In our dynamic economy, old firms die and new ones are born. The Labor Department learns about the deaths quickly, but it takes longer to learn about the births. The market is a bit confusing right now. I say it is time to turn to our trusty technical analysis and astrological tools to see what we should do. The prediction? Bullish! Gold is heading to $1,020 an ounce. The prediction? Extremely bullish! Oil is heading to $81. I think we can pretty much guess where our dollar and interest rates are headed based on those two predictions, right? Generally speaking, we might expect both to tank. However, these are not normal times. The prediction? We're heading to a whopping 112 from 83. Genius! The prediction? It's rising from 3.2% to 5.0%. Clearly the Fed will try to prop up that strengthening dollar in order to kill off our export business entirely and crush what's left of our housing market. Nobody would expect it and that's exactly what makes it so awesome. Genius! Okay, we've got $81 oil and 5.0% interest rates predictions. I'm torn. How should I invest? Part of me thinks that safety might be nice. The prediction? 0.0%. Wow. That's some spread between it and the 10 Year treasury. Clearly people won't be embracing risk of any kind. I think that pretty much tells us how we can make serious money though. Surely there must be somewhere else I can park my money with high oil prices, high long-term interest rates, extremely high unemployment, and people frozen in fear as seen in the treasury bills? Oh, I know. The stock market! Not just the stock market overall though, let's swing for the fences. The prediction? From 23.64 to 40.5! Extremely bullish! How about consumer staples? Should I be stocking up on toilet paper if oil is going back to $81? Hell no! "They" would be expecting that. The prediction? From 22.47 to 13.0! Extremely bearish! I'm reluctant to take the predictions of the future based on squiggly lines on charts from the past solely on face value though. That's why I also offer the other half of the prediction toolbox. Kaneko also predicts companies will start to hire again, but only part-time positions with no medical benefits. Families will cutback to compensate for higher living costs, and President-elect Barack Obama will be one of the most challenged presidents ever. Holy cow! I had no idea astrology could provide such detailed insights. How on earth do they do it? "Sometimes I will talk and I won't know what I'm saying until after it comes out of my mouth, then I hear it," said Kaneko. I'm having this strange feeling of deja vu. Have our masters been using astrology too? Treasury Secretary Timothy Geithner refrained from labeling China as a currency manipulator last week, backtracking from an assertion he made during his confirmation hearings in January. In its first semiannual report on foreign-exchange policies since Geithner became secretary, the Treasury said April 16 that while China’s yuan remains “undervalued,” no country “met the standards” for illegal currency manipulation during the period of the report, from July 2008 through December 2008. 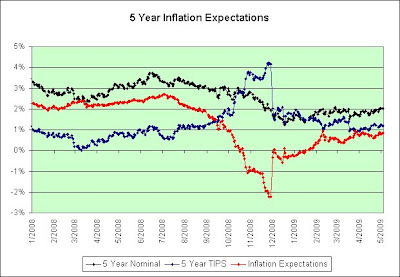 The following charts show the treasury market's expectations of future annual inflation rates. 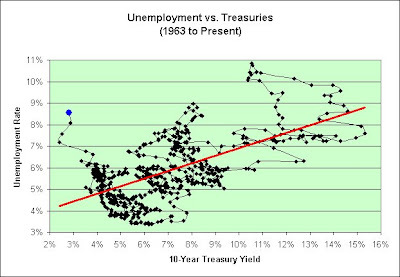 They use the yield on the inflation protected treasuries vs. the yield on their non-inflation protected counterparts to calculate it. Note that things started going to hell in a hand basket starting at about the same time the stock market began to crash in September of 2008. The TIPS market, being less liquid, really freaked out (as is seen in the dramatic movements of the 5 Year TIPS). For what it is worth, I was (and am) in TIPS. I managed to sleep through most of the excitement. Seriously. My TIPS were falling in value as yields were rising but the falling oil prices actually made me feel much better overall. In any event, I just rode out the storm. There is a warning here. 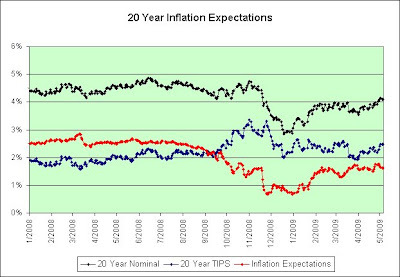 Inflation expectations can clearly turn on a dime. Literally. Let's hope we don't "mint/print" too many of them or our next inflation expectations scare might be to the upside. 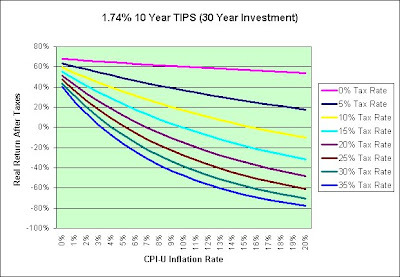 I will be one happy saver if inflation only averages the 1.63% over the next 20 years as shown in this chart. I'm not going to be holding my breath though. It seems like only last year that the treasury market predicted 2.85% inflation over the next 20 years. Oh yeah, it was last year, March 10th to be precise. Or perhaps I should have taken solace in the predictions of November 26th of last year? 0.67% inflation over the next 20 years would have been even better as a saver. Expectations change, sometimes rather violently. Unfortunately, my expectations have been rather stable over the past 5 years. I see dead economy. What do you see? I have included a red trend line, not that you'd have any problems seeing the trend. 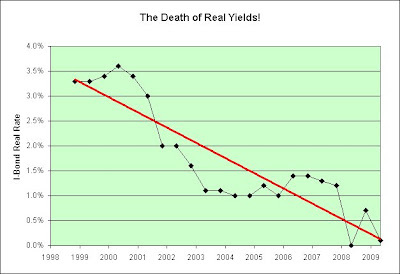 Real yields on I-Bonds died. Okay, a similar death of 10 Year TIPS was clearly not one of my better calls. I thought we'd be seeing it as savers would be forced to sacrifice for the common good. However, the bond market refused to go quietly it seems. Note the red trend line. Wow. Hands of a brain surgeon, that one. I guess I should have just stuck with my original theory. We're combining the very best of the deflationary Great Depression (real yields exploded higher) with the very best of the inflationary 1970s (real yields tanked). We've still got relative long-term price stability it seems, at least as it applies to canned goods and toilet paper. Unfortunately, both eras shared the following common theme though. Okay, so here's the premise of the computer simulation. Take 65% of the BLS average weekly wages and apply them to the cost of basic home ownership. I have assumed that 1.5% of the price of the home is needed to pay property taxes, insurance, and miscellaneous per year. The rest is used to pay principal and interest on a 30-year conventional mortgage. This is a "what do you want your payments to be" simulation, since that is the society we seem to live in. If two people are working, that works out to about 1/3rd of all income. How did I come up with that number? It simply did a good job of helping the model match reality (in other words, the red line most closely matches the black line in the chart below). 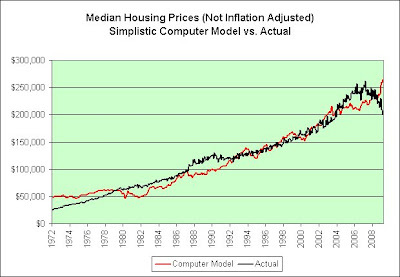 Note that there are two reasons that housing prices have increased over the years as far as the model is concerned. First, wages rose thanks to inflation. That meant that people could afford higher monthly payments. Second, interest rates have been dropping for decades. That allowed people to afford more expensive homes. The following shows what happens when it is adjusted for inflation. 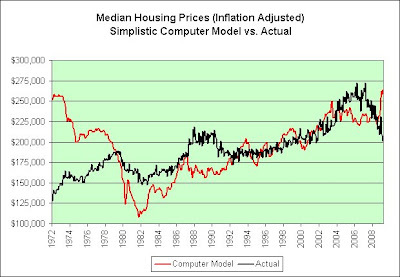 From 1982 to present the computer model expected inflation adjusted prices to rise substantially due to falling interest rates, and they did. So what went wrong? The computer model suggests we should be doing pretty good right now, but we're clearly not. 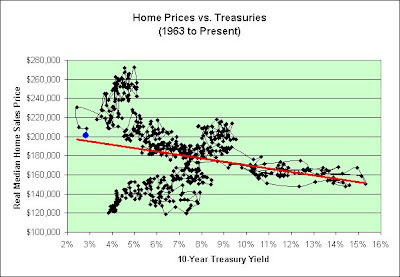 You will also note that the model expected falling prices in the 1970s, since interest rates were skyrocketing (and homes were therefore less affordable). That didn't happen either. People were scared of inflation and were buying up hard assets. It wasn't a "what do you want your payments to be" problem in my opinion. It was a "what do you want to spend your money on before it is worthless" problem. Using hindsight, 1979 was a bad time to be buying a home though (just like 1989 and 2006). That's one way to look at the data, but here's a few more ways. The blue dot represents where we are now. We also have low interest rates though. That should help in theory. However, as seen in the following chart something doesn't quite seem right. 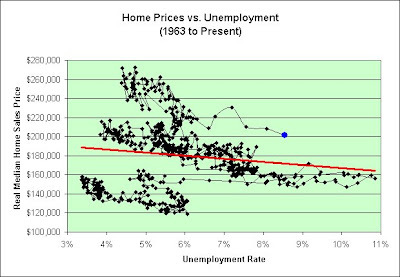 Low interest rates AND high unemployment? Why am I in this "blue" hand basket and where am I headed? Japan? Based on what I see here, stagflation does not appear to be imminent. May it never arrive. As a saver, I'd be just fine with that. On the other hand, we're clearly not out of the deflationary woods yet nor am I expecting a huge rebound in America's growth engine. I turned bearish in 2004 based on the idea we were trying to borrow our way back to prosperity. I grow more permabearish with each passing year and/or with each passing trillion dollars of new debt. Oh sure, we'll probably get a recovery of some sort just like we did the last time. I certainly wouldn't bet against it. Where will we be in 10 more years though? Exiting the woods or burning them to heat our homes? They've dropped to 0.1% over inflation! Since we've been in a deflationary environment, I-Bonds offered today actually pay 0% overall. The difference between 0.7% and 0.1% might not seem like all that much, but over the life of 30 years, that's actually a 20% difference. Here's hoping the economy improves by November 1, 2010. That's looking to be the next time I buy I-Bonds (rates reset each May and November). Only so many can be purchased in any given calendar year. I'm done for 2009. Rates on TIPS (Treasury Inflation Protected Securities) are much more desirable right now (by comparison anyway), thanks to the sell off in treasuries that's happened recently. Barring hyperinflation, that would seem to be the better bargain for those worried about inflation picking up. Here's some updated charts on how the 0.1% I-Bonds currently stack up against the 1.74% 10 Year TIPS. It's all about tax brackets and expected inflation. The charts assume holding the tax deferred I-Bonds the full 30 years to maximize their tax efficiency and reinvesting TIPS and the interest the full 30 years as well (under the assumption that the TIPS interest rate of future reinvestments remains constant). As you can see, there's almost no situation where 0.1% I-Bonds are a good deal (although during a severe deflation they are as good as cash which is a very good deal). You'd be way better off hoarding toilet paper and socks if you are worried about future inflation. At least you wouldn't have to pay taxes on the gains (assuming you didn't resell them, but simply consumed them over the years). 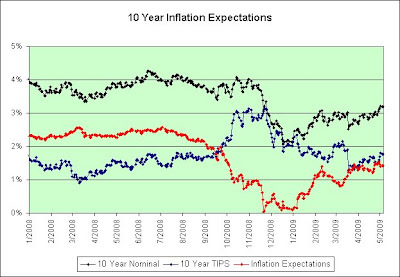 The TIPS situation is much better long-term, but only if inflation doesn't really pick up. Heavy inflation hurts us three ways with TIPS. First, the investment isn't tax deferred. We get hit each and every year with taxation. Second, heavy inflation gives the government more to tax. Third, heavy inflation could force us into higher tax brackets. Note that it is a fairly good deal if we aren't taxed though (see the 0% rate line). That makes TIPS pretty good for tax deferred retirement accounts (we'd still pay serious tax when we withdraw, but at least we wouldn't be nickeled and dimed each and every year we own them). That being said, if inflation protected TIPS end up being a really bad deal in non-retirement accounts because inflation picks up, then picture the damage that would be done to treasuries that aren't inflation protected. Ouch! Further, if the 1970s are any indicator the stock market won't keep up with heavy inflation either. That's why I have money in TIPS even outside my retirement account. As seen in the chart, it's not exactly a safe haven if we hyperinflate though. 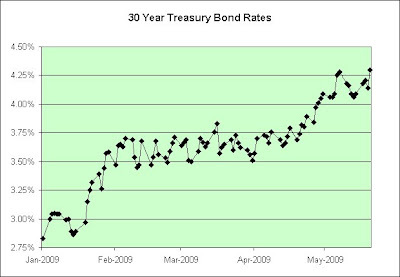 This last chart shows the break even point between TIPS and I-Bonds at their current rates. Coming up with good estimates on future tax brackets and CPI inflation are extremely important in deciding which is the better value. Generally speaking, TIPS are currently the better value if inflation stays under 6% though, no matter what your tax bracket is. 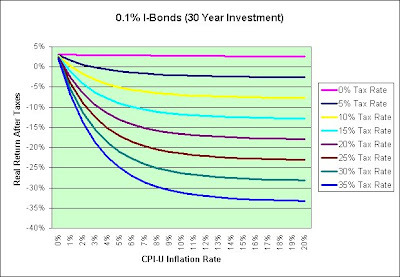 In the 25% tax bracket, inflation would have to average ~8% to make I-Bonds the better deal (and even then you'd lose money, as seen in the first chart). It's really hard to see any value in 0.1% I-Bonds. If you pay any taxes at all, they are guaranteed to lose if held the full 30 years. They say gold doesn't pay interest or dividends. Well, I-Bonds now only pay 0.1%. However, there is some value. I-Bonds don't just offer inflation protection. They have deflation protection too. I-Bonds cannot earn negative interest rates. That makes them as good as cash in a deflationary environment (like one we are currently in). It clearly isn't cheap to insure against both inflation AND deflation, but that's what I-Bonds do to some degree and that's one reason I have liked them so much in the past. 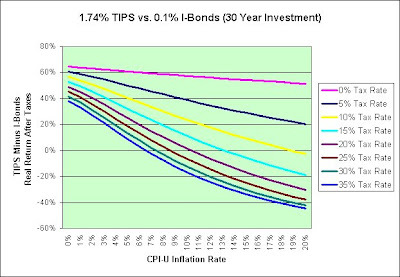 TIPS also have deflation protection, but it isn't as good as I-Bonds. I-Bonds can never go down in nominal value. TIPS can. However, if you buy TIPS directly from the government you are assured that when they mature you will at least get face value. When I first started buying TIPS, I didn't think that would be important. It might be though, if we can't break free of this deflationary mess. Please don't just blindly trust the math in my charts. I've made every effort to be accurate, but I'm not perfect. You can certainly recreate them on your own if you feel that the information is useful. This is NOT investment advice. A few years ago Costco was selling bath towels for $5.99 each. They were certainly "good enough" for me so I backed up the truck. Costco doesn't sell those any longer. They have what looks like slightly nicer towels for $7.49. Do I regret hoarding? Nope! That's a 25% increase in price. As a side note, I figure I've got about 30 years worth of towels. Since I'm 45 years old, I'm probably done buying towels. A few years ago Costco sold sheets for $54.99. I bought 10. From what I can see, those exact same sheets are now selling for $59.99. We have a 55 pound dog that sleeps on the bed. These sheets are strong enough to offset her claws. So far, they have proved to be more than good enough. All of them still look brand new. Most of them actually are brand new (as they are sitting in "hoarding" storage in another room). Sneakers were $14.99, then moved to $15.49, and are now back down to $14.99. I might just as well buried the cash in the back yard it seems, which in hindsight would have not been all that bad of a plan. In any event, I've got plenty and they are "good enough" to last me for many years. Here's my thinking. There was a huge price cut when we stopped making our own goods and had China do it. In order to get a similarly huge price cut in the future, China would have to stop making goods and find someone else to do it even cheaper. Just one problem. There isn't anyone left who can do it cheaper. Further, if China keeps using more and more oil, I find it hard to believe that China will be able to continue making goods as cheap as they are now. Therefore, it would seem that now isn't all that bad of a time to buy the things that are made in China. If I am wrong in my reasoning, how bad could it possibly hurt me though? I drive a 13 year old Toyota Camry with about 75,000 miles on it. It still feels like a new car! It is plenty "good enough" to meet my needs. Cars are not something I'd hoard right now. Why not? China isn't selling them to us, yet. How about hair dryers? Sure, what's the harm in having an extra one in reserve? We do. I haven't seen any worthy improvement in those in decades. And lastly, here's a reminder that there is one thing you can buy today that is guaranteed to be good enough. Forever stamps! They go up in price on May 11th. Don't wait until then. This is the closest thing to "sure thing" investment advice this blog is ever going to offer, lol. Littleton CO - On Monday, May 11, 2009, new U.S. and international postage prices will go into effect. The cost to mail a U.S. First Class one-ounce letter will increase two cents, from 42 to 44 cents. That's a 4.8% increase. Don't even ask me how many I have. Let's just say I won't need to buy more for MANY years. I've finally determined my political party. Until 2004, I thought I was a Republican. I just wanted a small financially conservative government that lived within its means. Wow, was I ever naive. I then thought I was a Democrat. I had two reasons. First, I knew I wasn't a Republican any longer. That was a given. Second, I really would like to help the poor and less well off. Unfortunately, there doesn't seem to be a plan to actually pay for it. That bothers me immensely. It isn't by choice. It's simply a realization. ...a banana republic also typically has large wealth inequities, poor infrastructure, poor schools, a "backward" economy, low capital spending, a reliance on foreign capital and money printing, budget deficits, and a weakening currency. A reliance on foreign capital? Check! A reliance on money printing? Check! A reliance on budget deficits? Check! If oil can stay at $50 during a near Global Great Depression, the mind boggles at the idea of where oil will trade once the global economy booms again, assuming it ever does boom again of course. Stagflation is low growth with high inflation. Maybe that isn't what we get long-term. However, I still argue that we'll be getting at least low growth OR high inflation. If so, stagflation will be at least half right, which is good enough for me. Here's my gut feel matrix for the long-term. As you can see, I'm very sympathetic to the deflation arguments, but I lean towards stagflation just the same. I'm a believer that a determined government can ruin its paper currency over time (patience is a virtue). Further, the central bankers are currently working overtime. They seem very determined.